Whenever I have a handful of photos and no ideas for a specific post about them, they go into this category. 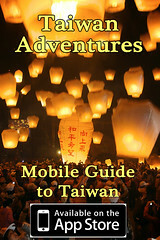 This first one was taken on my recent four day trip to promote tourism in Taiwan. Most of the trip I was worried about getting video footage and not photos, but when whenever we had a few minutes to take some goofy pictures, we did. Here, Phil from 老外的臺灣旅遊日記 (A travel blog in Chinese) jumps over me and my camera. It’s definitely a quick and dirty shot, and I hope to take more with more proper lighting in the future… On camera SB-800 shot TTL… 1/250 sec at f/22. 14-24mm at 14mm… And the lens was real dirty from the previous four-wheeling shoot.